It's easy to use the AS7262 with Python or CircuitPython and the Adafruit CircuitPython AS726x module. This module allows you to easily write Python code that reads color data and temperature from the sensor. You can easily wire this breakout to a microcontroller running CircuitPython. We will be using a Metro M0 Express. This sensor uses I2C address 0x49. 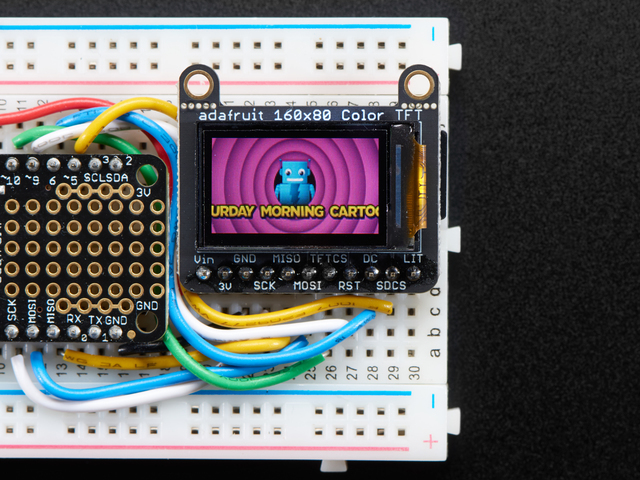 You'll need to install the Adafruit_CircuitPython_AS726x library library on your CircuitPython board. You can also download the adafruit_as726x.mpy from it's release page on Github. Before continuing make sure your board's lib folder or root filesystem has the adafruit_as726x.mpy, adafruit_register, and adafruit_bus_device files and folders copied over. To demonstrate usage we will initialize the sensor and read it's onboard temperature sensor from the board's Python REPL. As long as you get a reasonable temperature (usually around 28 degrees C) you know your sensor is wired up correctly and working! Below is a complete example that reads all color channels and prints them out as a graph in the REPL. Save this as main.py on your board and open the REPL to see the output. This guide was first published on Mar 28, 2018. It was last updated on Mar 28, 2018. This page (Python & CircuitPython) was last updated on Apr 22, 2019.